Moving ahead to six years after the end of the Civil War: Milton Wright was born in Indiana in 1828. As an adult he became a minister in the United Brethren Church, and in 1859 was he married to Susan Koerner. 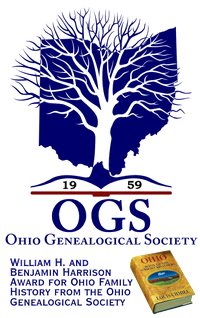 He was made editor of the church’s newspaper in 1869 and he moved his family to Dayton, home of many members of his extended family. With a six-week-old Orville Wright comfortably nestled in his family’s home on Hawthorn Street, the city of Dayton was preparing for a visit by the president of the United States. In just the sixth year after the end of the Civil War, the Soldiers Home in Dayton had grown to become the foremost national center for the care of disabled veterans. There had been two other Veterans Homes created after the war, in Maine and Wisconsin, and the Dayton home was known as the central branch. The growth of the center had the effect of focusing a good deal of national attention on the city. Over the course of the 1870s the Home would be the frequent recipient of visits by presidents and formidable generals of the Union. On October 3, 1871, President Ulysses S. Grant came to Dayton to pay homage to the veterans. As the former commander of the Union Army in the field, the president and commander in chief’s ties to the veterans were deep. When President Grant came to Dayton in 1871, there were already 1750 disabled veterans housed at the center. As the infant Orville Wright was gaining his bearings in his family’s home on Hawthorn Street, a block away another caravan of dignitaries would be streaming out West Third Street to the Soldiers Home. Although the ceremonies would pass unnoticed by the infant Orville, events indicate that the older Wright boys, Reuchlin ten years old, Lorin eight, and Wilbur four were well aware that the President of the United States was passing within a block of their home on that early fall day. President Grant’s train arrived at the Union depot downtown on Sixth Street at 8:30 on Wednesday morning October 3. 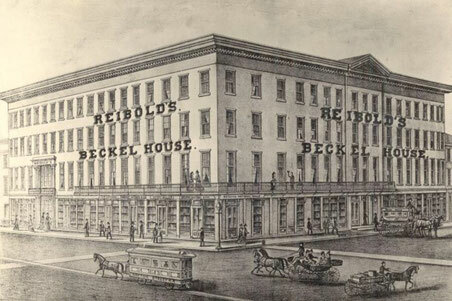 He was greeted there by a military band playing, “Hail to the Chief.” Accompanied by his wife Julia, his youngest son Jess, and his daughter Nellie, they were all led to carriages for a procession over to the Beckel Hotel at Third and Jefferson Streets where they would stay for the day. Out in front of the carriages as they moved onto Sixth Street was a platoon of the Dayton Police Force, a column of the Knights Templar, the Dayton Zouaves, Wheelers Band, and an assembly of the colored citizens of the city. President Grant’s carriage, with the chairman of the reception committee General Woods aboard, was followed by a carriage with his wife Julia escorted by Admiral Schenk. Next in line was a carriage with his daughter Nellie, escorted by Judge Lowe, followed by the carriages of the reception committee. The streets to the Beckel House were filled with townspeople as the president’s carriage passed by. President Grant bowed to salutes from either side of the street. At the Beckel House where a great crowd was assembled, the entourage was escorted into the lobby of the hotel. A few minutes later in response to calls from the street, this second Ohioan to become president appeared on the balcony where he bowed to the people, and they responded with rousing cheers. The president and his family then retired to their rooms to rest from a long night of travel. The crowd now rushed upon the President and gave him hearty greetings in the parlor. But the parlor proving inconvenient, he removed to the front, and the crowd, kept in excellent subordination, passed him in grand review, men, women, and children shaking hands with him. Many of the little ones were highly delighted with being kissed by the President, and as has been often observed, the greeting of the little folks seemed to afford President Grant particular pleasure. To shake hands with men, as in all such cases, was a courtesy which his position required; but the little folks commanded the brightest smiles. The working people called in great numbers and shook hands with him. The last to call were the teachers and children of the public schools, who paid their respects in overwhelming numbers. It is expected that ten-year-old Reuchlin Wright and eight-year-old Lorin were among the public school children to welcome President Grant to Dayton that afternoon. It is also likely that the editor of the Telescope, Milton Wright, walked the two blocks over from his office at Fourth and Main Streets to view the welcome for the president that day. The experience should have prompted lively dinner conversation in the Wright home that evening, conversation that would reach the ears of four-year-old Wilbur Wright. Such conversation was something that Reverend Wright always encouraged and cultivated in his children. After the formal welcome at the Beckel Hotel, at one o’clock the entourage of the president made its way out West Third Street to the Soldiers Home. In the coming years the West Third Street corridor and business district would continue to expand and be nurtured by a continual flow of traffic out to the Home. With the volume of soldiers from states throughout the North who were cared for at the Home (they were from as far away as New York, Pennsylvania, and Massachusetts) there would be a constant stream of relatives and friends who would come into Dayton by train, and travel out West Third Street by carriage or by traction car to visit with the veterans. Entourages such as that of President Grant would become a familiar part of the tapestry of the community through the years. distance a small lake riveted the eye. 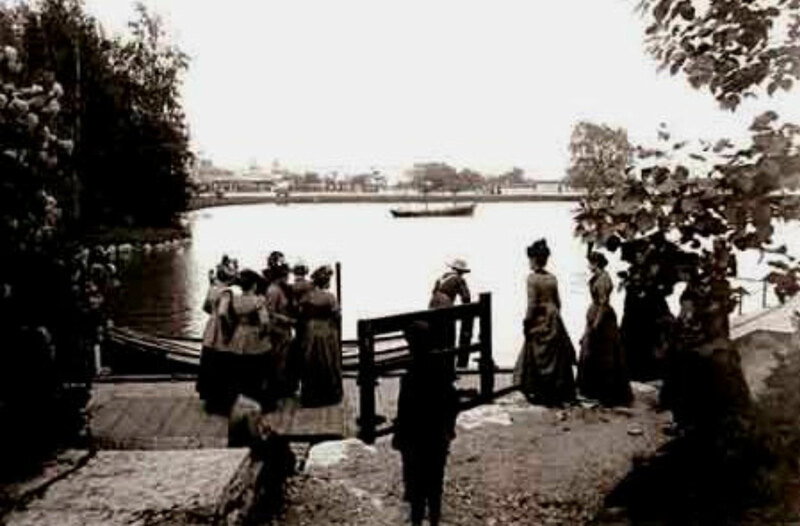 The lake was a regular destination for veterans and visitors alike strolling the grounds of the Home. It was a location that in the next decade would play a significant role in the course of the life of Wilbur Wright and in what would become the legacy of the Wright brothers. As the procession approached a battery on a high part of the grounds, a thundering twenty-one gun salute was fired and the Home Band broke into “Hail to the Chief” followed by “The Conquering Hero Comes.” Further on, the president passed through a large arch inscribed “Welcome to the President” where a thousand veterans were drawn up in formal dress on the parade grounds. After a review of the troops, the president was driven around the grounds to show him the development of the Home as the veterans began to move to an assembly around the chapel. In response President Grant rose and spoke. He said to the veterans before him on the occasion that he desired to express his sincere gratification for the opportunity to meet them. It gratified him to see them so comfortable and happy. He said that they had received their wounds in an honorable cause and deserved the deep gratitude of the people. The president thanked the veterans for their cordial welcome and took his seat as they gave him nine hearty cheers. Mr. Gunckle then introduced the attorney general of the United States, Mr. Amos Akerman, who went on to thank the veterans for their service. He said to these men who had stood the brunt of battle, that any eulogy of words would be a thrice-told tale. The attorney general said the best eulogy he could offer would be the exhibition of a restored country, happy and prosperous. Again thanking the veterans for their service, Mr. Akerman took his seat. The veterans again offered President Grant a thunderous round of cheers as the formal ceremonies of the day were concluded. At around five o’clock the president returned to the city. At six o’clock in the evening a bountiful dinner was held at the hotel for the president, the attorney general, and some twenty other dignitaries. Near midnight after an evening of relaxed camaraderie and humor, the reception committee accompanied the president back to the train depot where he departed with his family for the trip back east. The President’s visit would be a subject of conversation for some time to come in the Dayton community. 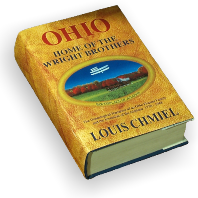 On October 3, 1871 in the Wright family home, as the infant Orville Wright was finding his way into the world, his older brothers were talking about the visit of the president of the Unites States to Dayton. It was another in a series of visits that over the years would have notable national figures making their way across the streets of the city because of the National Soldiers Home.